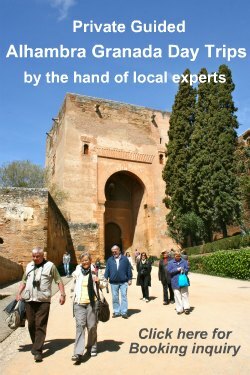 Alhambra Granada Spain Information and Tours - Shore Excursions! 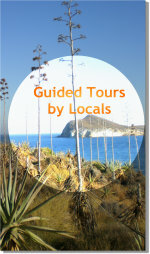 We have been specialising in Shore Excursions from ALMERIA and MALAGA to GRANADA since more than 15 years! 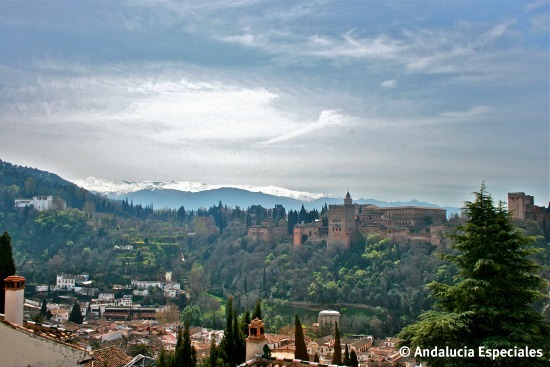 Welcome to Alhambra Granada Spain - one of our most visited and most famous cities in Spain! From the Islamic period remains the world famous UNESCO heritage ALHAMBRA palace which is Spain’s most visited monument! Only 250 people are allowed to enter into the palaces each half an hour and these strict limitations are certainly very appropriate! I can remember the times when hundreds of people were around, in all the halls of the Alhambra, it was just simply too much! Whilst some people are annoyed about these restrictions by UNESCO, I believe that it is necessary, for your enjoyment as a tourist and of course for the Alhambra property itself! It guarantees that the visit is comfortable and it afford maximum protection for this sacred palace. Naturally, we have to be very strict with the timings of the journey. Should we miss - for any reason - the entry times (as printed on the ticket), we will be refused entry.For that reason, any trip to Granada has to be carefully planned and perfectly organized in order to make the best of the day! Whether you come by cruise ship to Almeria, or whether you arrive to Malaga, we may offer our service: we will pick you up just right at the entrance of the port, our driver will carry an identification notice with your name on it and you will immediately leave the port, for Granada. Upon arrival, we will visit the Albayzin, where we can take a short walk to the Saint Nicolas viewing point, just opposite the Alhambra. Here you will enjoy the best views of the splendid palace. As it is forbidden to drive through the city centre, we start our next stage of the tour from the closest possible point.. As most visitors do not have a comprehensive enough knowledge of the city, a guided chauffeured tour of Granada is vital. Within the centre of Granada, few areas remain from an Islamic era; Alcaiceria the former silk market, a mihrab in the former madrasse (Koran School), now a University administation centre and Corral del carbon, a former caravan stop and marketplace. Other places of interest are the Christian monuments such as the Cathedral, built upon the ruins of the former main mosque and the impressive Royal Chapel, which is part of the Cathedral, which keeps the tombs of the Catholic Monarchs. I’ll tell you more about the history of the Catholic Monarchs, who were the founders of the modern Spain, as we tour the building. On 12 October 1492 Christopher Columbus discovered the new continent now called AMERICA, and thus made Spain the most powerful nation of the world at that time....Close to the Cathedral, at the square Isabel la Catolica, we visit monuments that are associated with the signing of the 'Capitulations of Santa Fe'. The Zacatin street , former bazar and the Bibrambla square, former square of tournaments, are nowadays full of souvenir shops, cafes, tapas bars, a herb market, and more.... Enjoy a little time in town, enjoy some tapas and then let us take you to the Alhambra Palace. As only the official guides of Granada are allowed to guide you through the Alhambra Palace to you, we offer you two different options: we can book a private guide of the Alhambra for you, or you go in on your own as one of the limited number allowed that day, during which time you spend your time being guided by way of audio tapes. A price preview for each of these options can be found in our quotation. You should allow 2 hours minumum to visit the Alhambra Palace. Once the Alhambra tour is finished we depart Granada and head back to your ship or to your Hotel. We would need a minimum of 8 hours for this trip and a maximum of 10 hours and with our knowledgable guidance it truly will be a great day! Thank you for your interest in our Alhambra Granada Spain tour. Please don’t hesitate to ask for a quote! We wish you a wonderful time in Andalucia!